Skyfalls is the first map of an apparently unfinished campaign by Alex “Gorthaur” Jones that borrows much geometry from Na Pali Haven and the Sunspire from the original Unreal, thanks to which it undoubtedly has the unreal feel one might be looking for. Other than that, unfortunately, it can hardly provide. Skyfall has a complete lack of storyline which means no translator messages or any other hint as to what the player is doing. The player is dispatched with no weapon and ammo, and by the time he manages to pick up an automag it is badly needed. 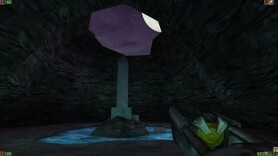 The level is packed with a variety of enemies that need to be defeated using very scarce resources – making the map annoyingly difficult for many players. After a series of button-pushing without hints as to what the buttons do (find out yourself) the map ends in a skylift where the game tries to load the second map in the series -one that never was released. This is the auto-generated forum topic dedicated to Skyfalls.